By now, you’ve probably read enough about why content and content marketing are important for your business. So, we’re here to answer the “what” and “how.” A lot of blogs will tell you to think like a publisher, which is funny, because the traditional publishing industry is kind of dying. We’d rather encourage you to think like a businessperson who is using publishing as an effective conversion tool. Why? Because people simply reading and liking your content isn’t going to increase product sells. Rather, you have to make sure your content builds trust in your brand, positions you as an authority figure, and assuages any fears your reader might have in working with you. Here are a few questions to ask yourself as you get started. Building trust and rapport with your clients. Providing solutions to client problems. Building your reputation with SEO. If you read the vast majority of articles on content marketing, you’ll be falsely led into believing that writing blog posts is all there is to it. In reality, the definition of “content” is really up to interpretation. And so on. (You don’t need the alliteration — we’re just having fun.) But content can be anything you think could be useful to clients, partners or leads. This depends on the type of content you want to produce and how large your company is: Are you a solo agent or the manager of a brokerage? What does your budget look like? And so on. Regardless of size, however, it’s imperative that you have someone on your team who is a strong writer and editor. If you can swing it, a graphic designer will also do wonders for your business. After all, real estate is a profession that relies quite a bit on aesthetics — from the agent’s demeanor to the house’s decor, it’s all about presentation. At Placester, even though I lead the sales and marketing team, I create a lot of the content myself so I can make sure it’s expressing our company’s DNA. Even though our small marketing team cranks out a ton of content, we realized there were lots of voices within the company that have great value to share with our audience, so we’ve recently encouraged members of the sales and support team to begin writing and sharing their specific expertise. We have the benefit of having professional editors on hand to ensure a consistent brand voice, and so far that’s working out well for us. When you get ready to begin scaling your content marketing team, check out these great tips by Smart Insights on Hiring the Right Content Creator for Your Business. Remember: It’s not enough just to create content. If no one is reading or sharing, you’re simply wasting time and money. Hire great designers, writers and editors who will create clickworthy content likely to represent your brand well and bring in new clients. 4. How do I measure my efforts? As we’ve mentioned before, simply creating content won’t cut it for your business. You must also track what’s converting well for you: What type of content or topic is inspiring current customers and pulling in new leads? Thought leadership: requests for guest blog posts. You also need to look at what devices they are viewing your content. Are they looking at it at work from their desktop or on the go from their mobile device? And which of those devices are driving the highest intent customer? 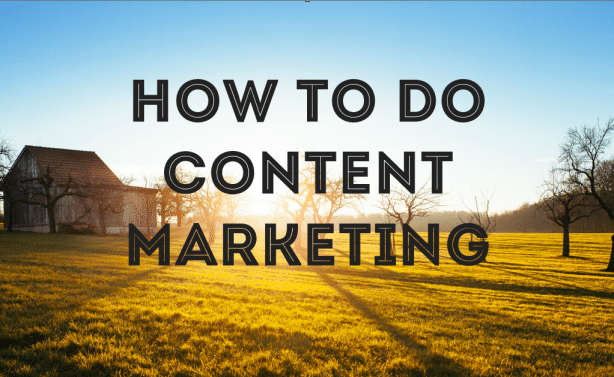 I hope this guide was helpful in getting you started with content marketing. Let me know if you have any questions or suggestions. You can comment below, send me an email, or find me on Twitter: @sethstuff.